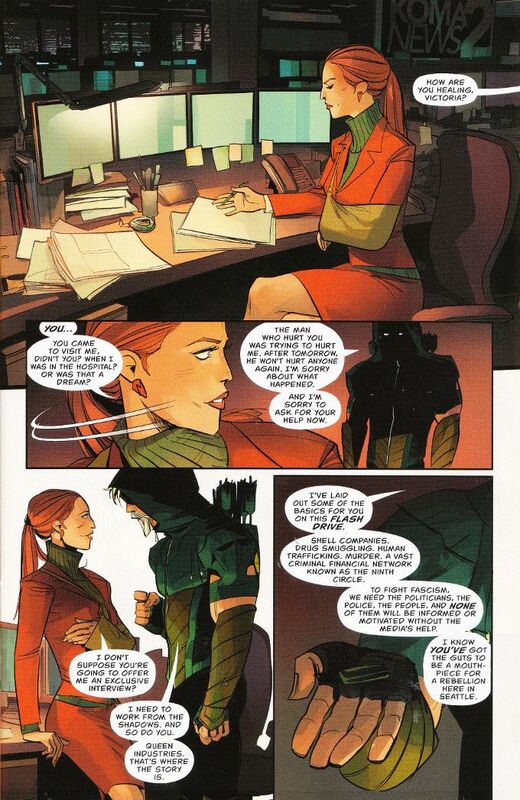 Otto Schmidt is back on the art duties this time around and in fine form for the most part. The action sequences are well-paced and even the few sedate scenes of people just talking have an inherent intensity. The only glitch is some oddities in the faces of Seattle's new mayor and the Ninth Circle member who is handling him. I've noted before how well writer Benjamin Percy has been drawing upon the classic Green Arrow mythos - particularly the stories of Mike Grell. 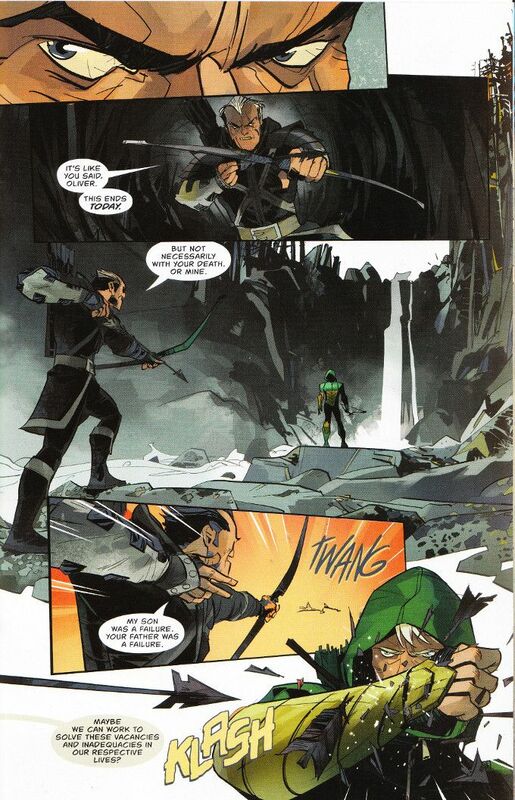 This issue sees him trying to introduce some elements of the Malcolm Merlyn/Oliver Queen relationship from the TV Series Arrow into the narrative. The actual execution, however, seems closer to Norman Osborn and Peter Parker in the first Sam Raimi-directed Spider-Man movie, with Merlyn attempting to turn Oliver into the heir he wanted. How well this change will play out remains to be seen. Personally, I find it an odd development given Percy's stated desires in the past to keep Green Arrow as a series separate from Arrow. It's particularly strange given the deus ex machina at the end of the issue involving a supporting character whose presence in the series I've questioned. Regardless, this is still the best Green Arrow series in years... even if it does leave me frustrated at times as a reader and fan.